A gentle breeze caresses us as we wander in the woodland. The sun shines through the trees around us. The leaf bearing branches move in the gentle wind. The jigsaw of shadows and sunlight trace a moving pattern upon the ground. We breath the air that is causing the movement and the gentle whispering noises in the forest. Our planet is surrounded by an ever moving and turbulent atmosphere consisting of a mixture of odourless gases which are invisible to our eyes. They meander freely across the surface of the world bringing constant changes in temperature and humidity. They move the clouds that obscure the light of the sun. They bring the rain and the soft winds of summer. They feed the whirlwind and the ferocious hurricanes. We take for granted the air which surrounds us. How often do we stop to wonder at the delicate balance of the atmospheric gases which has been maintained upon our most favoured planet over vast periods of geological time. It is only when we examine the discoveries of the last five hundred years that we learn to appreciate the ongoing miracle of our existence. Our atmosphere is ideally suited to our form of life simply because it developed along with that life and is itself the product of biological evolution. The main gases are oxygen and nitrogen. It is the oxygen that sustains our life yet it is also the cause of decay. Present in smaller amounts yet just as vital to life on Earth are water vapour and carbon dioxide. Without them both the plants and animals would die. Also they retain the heat of the sun and if their concentrations were lower our world would be far colder. With more of them it would be much warmer. With too much carbon dioxide our Earth could suffer a run-away greenhouse effect and become a raging inferno like its terrible twin planet Venus. As we live on the land we often forget that three quarters of our planet is covered by oceans, seas, lakes and rivers. If we stand by the sea shore then perhaps we realise that life arose in the sea and water is the very substance that lubricates the processes of life. When we watch the sunset or sunrise we remember that other important factor that sustains life on the planet. It is the Sun (poetically called the day star for it is so brilliant that all the other stars are invisible in the daytime). The picture taken by the author of the sunset over the sea at Noordwyck in the Netherlands illustrates the fact that our life as land animals depends on the presence of liquid water, 'solid' land and a stupendous thermonuclear furnace (a star) which we call the Sun. Noordwyck is the home of ESTEC, the technical headquarters of the European Space Agency. 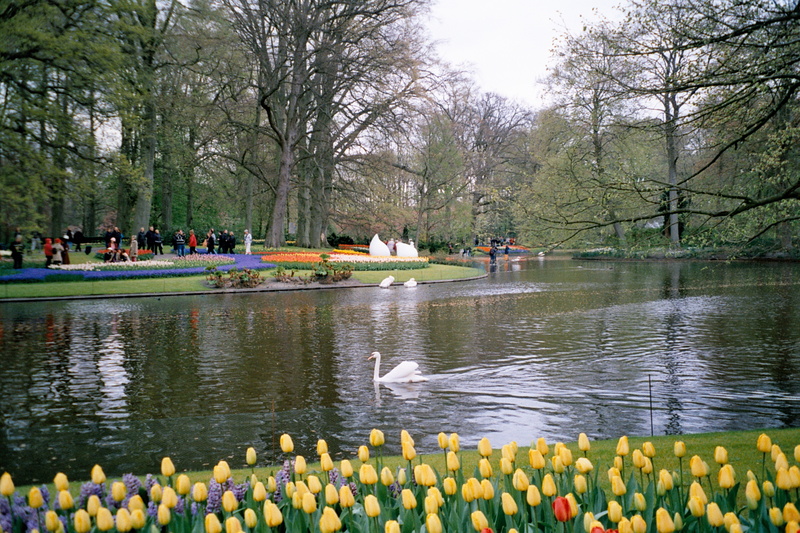 The picture on the left was taken in the Kerkenhof Gardens in the Netherlands not far from ESTEC. When we examine the other planets of the Solar System and consider the reasons why Earth is such a special place, we realise that even on planets orbiting other stars the conditions for life are likely to be relatively rare. The Earth is indeed an oasis in the deserts of space. But many scientists believe it is not by any means the only oasis. The most important factors seem to be the presence of water in the liquid form over large parts of the planets surface and its existence for vast periods of geological time. The presence of a stable star is also of enormous importance. Without the presence of liquid water life processes as we generally know them would seem to be unlikely and for most of this website we shall consider our type of life. Other important factors BUT probably not essential in the same way as the presence of water are the presence of a large moon, plate tectonics and the presence of the ozone layer and the magnetosphere. Let us now consider the important question of the habitable zone. The diagram on the left above shows the Inner Solar System (courtesy of NASA). It can be seen that the Earth lies between Venus and Mars. Earth lies at a distance from the Sun that produces temperature conditions that allow water to remain over most of the planet in the liquid phase for vast periods of geological time. It lies in the HABITABLE ZONE. This is sometimes poetically described as the GOLDILOCKS ZONE. Venus is too near the Sun and is too hot - Mars is too far away from the Sun and is too cold. Earth is just right for life to evolve.